Complete a survey to contribute to research on Military, Veteran, and Family Health. Help us promote the role of occupational therapy in this field and plan professional development to prepare OTs to work in this area of practice! CAOT is focused on increasing the complement of occupational therapists serving in federally administered health plans where they add high-impact, low-cost value through client-centred assessment, intervention and rehabilitation. Occupational therapists have a long and rich history of working with Canadian Armed Forces (CAF) members and Veterans. 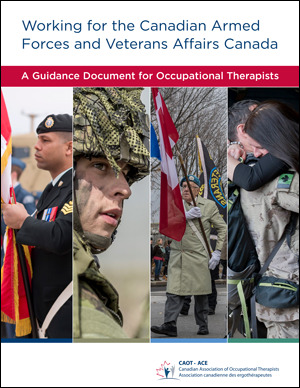 In light of this, and to better prepare occupational therapists for working within the military, CAOT has collaborated with CAF and VAC to produce a guidance document that articulates the specific occupational therapy skills required to meet the mandate of these two departments.